Robotic control systems, motion planners, and applications typically require a significant level of specialized technical knowledge. Since robots are usually costly investments, ventures into applications caries significant risk should integration not function to expectation or complete on time. Despite their fantastic utility when fully operational, robots still aren't something you can simply pick up, put on your desk, and have performing sophisticated instruction sets without error yet. I wanted to see just how difficult it would be to develop applications for a multi-purpose robot that I could afford to take the risk on, so I backed this project on Kickstarter. Dobot is a company that has developed an inexpensive SCARA Robot available for under $500, and they are progressively open-sourcing hardware and software components as they become refined. 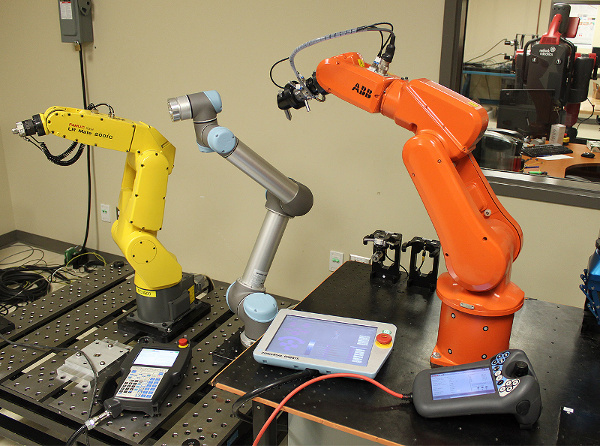 The Dobot developer network has included controls that afford linear and angular motion, as well as independent laser, pump, and gripper adjustments in a small desktop package. 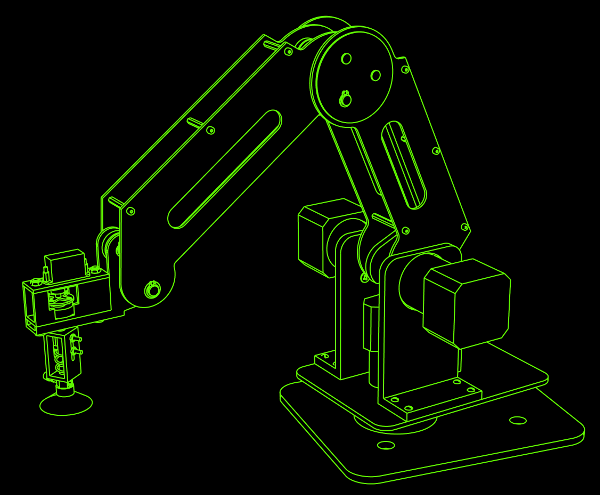 While the Dobot Robotic Arm is not designed for industrial loads, it does provide means for reliable mechanical simulation for what industrial robots are capable of at a safe price. Robotics [n]: "the design, construction, operation, and application of artificial agents"
Controls [n]: "open or closed-loop director of system or device response to stimulus"
GCODE [n]: "the most widely used numerical control (NC) programming language"
Network [n]: "communication between systems using a shared protocol"
Computer Vision [n]: "artificial visual to physical perception for computer systems"
API [n]: "describing a software component in terms of its operations, inputs, and outputs"
Since the Dobot team made their software open-source, I was able to take a look at their communication protocol and use it to make a more adaptable control software. While the firmware and communication protocol are still in beta and had several bugs, it was stable enough for me to successfully implement a low-cost laser-cutter/engraver at 10% the price of the going rate for even the least expensive desktop laser-cutters like the famous Glowforge. I wanted to add a little bit of extra convenience to my software, so I included an untethered network experience along with the drivers and G-code interpretation service. 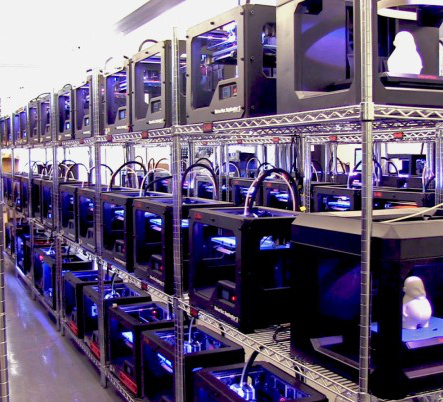 The 3D printing industry was able to quickly expand because the DIY, maker, and open-source communities aligned their common goals with a collaborative development processes. Any single organization could not have completed this alone due to the breadth of knowledge that needed to come together into a concise and well-documented application. Once the downstream APIs (G-code) and drivers (//Marlin, Repetier, etc.) 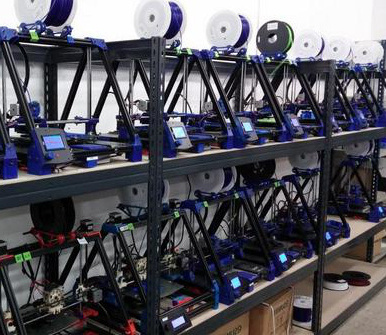 were refined and robust electromechanical integrations of 3D printers (//RepRaps, Makerbots, etc.) were published, built, and tested, things started moving really quickly in the direction of mass consumer adoption. Developers like foosel even made a wireless print server called OctoPrint to break the tether required between the printer and the host computer. This allowed for users to control their 3D printers untethered, and even remotely queue, kick off, and monitor their prints. Client controls robot step by step using jog mode buttons and visual feedback. this._PORT.write(buffer);			//send over that buffer on next() heartbeat! DEEP BREATH ... TEST ... IT WORKS! You can now connect the a small computer (e.g. Raspberry Pi) to the robotic arm and start up the server on that computer on boot up. You then connect that small computer your local area network via wireless or ethernet, and when you access that computer's IP or hostname via another locally connected computer (your laptop, tablet, or cell phone) you are returned the interface to control the robotic arm. An extra layer of security SHOULD be implemented on top of this to require authentication and prevent unauthorized use of your robotic arm, but that adds a layer of work I haven't implemented yet. This could be done by establishing a unique user token after a user provides correct username and password upon contacting the robot server. This token is then used in subsequent communications over a secure HTTPS protocol. All communication without the correct token will be ignored. Using this control system I have also implemented the capability to upload GCODE files containing sequential commands for processing by the robot. The details of that implementation will not be covered in detail, but it basically operates by sequentially stepping through and sending each command in the file (newline delimited) as the robot responds that it is ready for to receive the next command. This is done using a command queue that is incremented as the machine becomes ready to receive the next command. The test application shown below demonstrates running a GCODE file to produce a desired output from the robot. The last implementation using computer vision will be covered in a future blog entry. 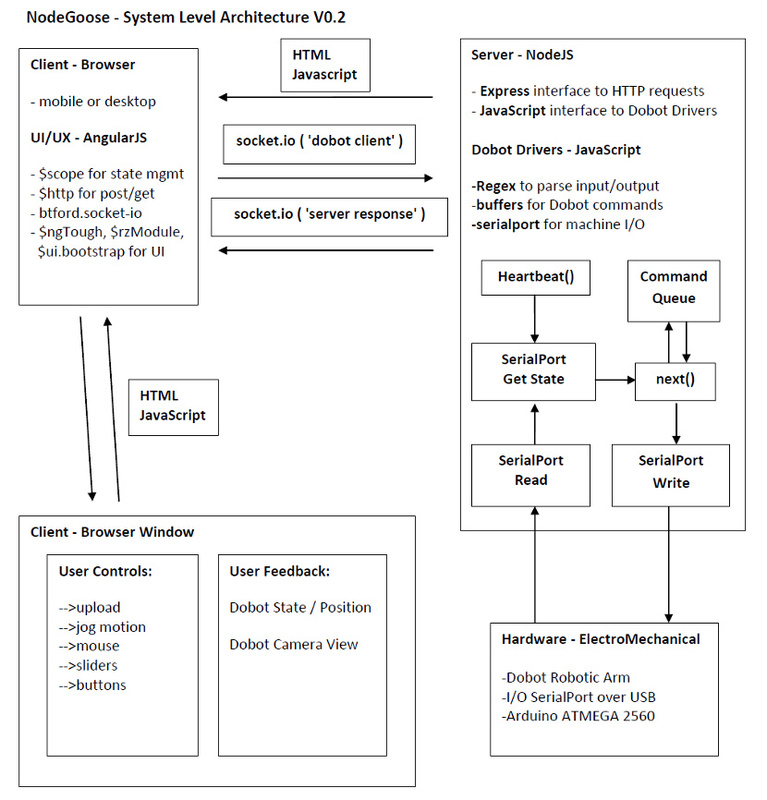 NodeGoose is a very early implementation for browser-based robot control similar to OctoPrint for 3D Printers. 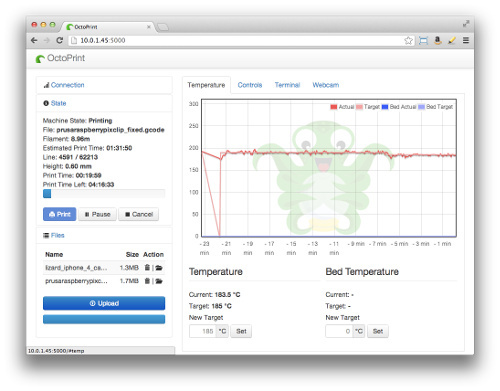 OctoPrint provides a utility written in Python using Flask and Tornado Frameworks that allows fully remote control of 3D printers over a local or remote wireles. NodeGoose is not as feature complete as OctoPrint yet, but I plan to keep adding features as I think of new fun applications for the hardware! I chose to use the laser feature as my initial demonstration for a useful application of the Dobot and the NodeGoose software platform to control it. Laser-cutters are expensive, and a highly sought after prototyping tool. Just look at the tremendous crowd-funding success of the Glowforge! One advantage I have here is price: I made it happen for about $500 right now, whereas the Glowforge is $5,000 and still only on pre-order. The only disadvantage I have with the Dobot currently is that its 12 Watt laser cuts more slowly than the typical 70+ Watt used in commercial laser cutters. I believe we are just at the beginning of the affordable and accessible robotics platforms. 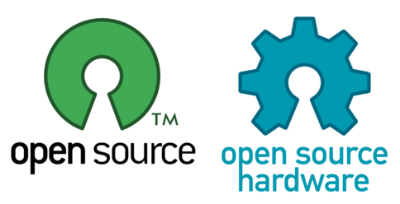 There are much more complex and powerful libraries and development environments for industrial applications like ROS, but these are overkill for the uses a typical garage maker would have for an inexpensive small consumer robot. Once we make the powerful features of advanced motion planners, computer-vision, and robot control available in a language more makers can understand and implement, I believe we will transform the future through massive development of highly versatile and seemingly intelligent robot counterparts. 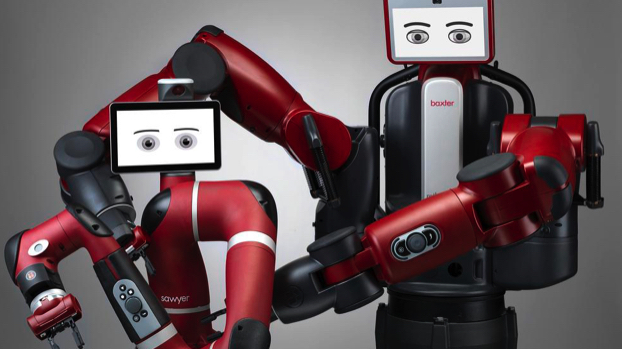 Say hello to Baxter and Sawyer from Rethink Robotics! A versatile robotic platform allows for multiple applications whereas task-specific robots can only complete one, constantly running the risk of becoming unsupported, obsolete, or overpriced. When you pair that hardware versatility with easy-to-use software, the sky is the limit. When someone asks if multi-purpose robots and open-source software will transform the future, the answer is "yes, absolutely!" You can read more about the details of the software implementation and follow updates at GitHub.